and of course she also sculpted the Vietnam Women’s Memorial that’s on the National Mall in Washington. Even Glenna’s flaws have artistry. That’s if she has any, flaws I mean. Eric’s depiction of an airplane flying above the clouds on the front of my bronze is a take-off of his 59 x 75 foot mural that’s on the wall of the National Air and Space Museum in the Smithsonian. Lindbergh’s famous airplane, the Spirit of St. Louis, hangs in front of the mural. Eric said that I was flying the airplane in my little painting. His smiling words fell softly on my willing ears. Such was his friendship. Glenna captured that mischievous smile on Eric’s face. I know it well. It meant he was about to say something entertaining, probably at my expense. He was the most productive man I ever knew. He could paint a major painting a day, lunch with me, and dine out with his wife that night. And he wrote fifty books in fifty years, or close to it. I talked about that in his biography, Seventeen Dollars a Square Inch. Glenna also gave me a $1,000 bill. It was to commemorate ten years of being in the art business together. If I’d put it in an interest bearing note when I received it, thirty-three years ago, at 6% interest compounded annually, it’d now be worth … oh, never mind. Maybe someone can tell me. I flunked math class in high school. I don’t intend to spend the bill, but if someone steals it, please keep your eyes peeled for me. Its serial number is J00003274A, and it has President Cleveland’s picture on the front. If it had been my choice, I’d have probably put Eric’s photo on it. This entry was posted in Forrest's Scrapbooks and tagged Clues, eric sloane, Forrest, Forrest Fenn, glenna goodacre, hidden treasure, Poem, Treasure Hunt by dal. Bookmark the permalink. Forrest, that bill is worth between $2,000 and $3,000. Yes, but the bill would have to be surrendered— and all it’s history with it. Thus, its value would certainly be greatly diminished. I can give it back. Perhaps I could of used a word like awesome. If it wasn’t for you Forrest and the Thrill of the Chase I would may of never been able to visit Yellowstone and the surrounding area. It was a childhood dream to go there someday. So when I got hitched last year, that is where we went for our honeymoon. It was the best time of my life and hers as well. We researched Eric and found the mural. Now we want to save our money and go there on our next trip someday. I estimated a 2 week trip there to see the museums. We have many stout Roosevelt dimes saved for the trip. Thanks for that AWESOME video, William. I can see Forrest…and Eric…and Glenna all punching cougars in the face. “Take that! Don’t mess!”, they’d say. They all truly grabbed the buffalo of life by the horns…and rode it…into the sunset. 🙂 By their fruits ye shall know them. May the sun never set. This is AWESOME! I wish I could give you a million upvotes. Hilarious! Would love to see a picture of the ballerina you cast for Glenna. Maybe she will send Dal one to post. All little girls that never grow up want to be ballerina’s. How about a ten thousand dollar Gold Certificate ? Now that would be the Title to have ! Now here is a hoard to have ! Forrest, I believe that would be $7427.00 ? But I think its priceless. When I was little, my parents got my brother and I a weather station. It had a book in it with pictures of all the different clouds. I wonder now if Eric had painted those images. They had books already when you were a kid?? Was it in black and white or color? But seriously, the kit was cheap, just a stamped steel box that had a plastic wind vane and a plastic cup anemometer and plastic rain gauge and none of it ever worked right. But the book was nice, it was black and white. I can remember my brother and I laying outside comparing the clouds to the pictures trying to determine which was which. That smile on his face is priceless! Your friendship touches my heart. Hmmmm…did you gobble amy up dal? She disappeared after this…??? Ahh.. good friends are like family. In regarda to your currency. I will help you with the math. 33 years ago I believe we were in a bad recession and interest rates out the roof. The dollar was worth about 30% of its value. Therefore I would be willing to give you 300.00 for that evaluation at that time and an additional 200.00 for interest because I’m interested. Here’s the math: 1000-70%+68%=500.00. I will send you a self stamped addressed envelope for yor convenience. If the math doesn’t seem right, trust me,it is. Aarrgh. It’s good to see your “aarrgh” again.. Thanks Dal. Glad to be back. Catching up to do. Well glory be, do my eyes deceive me? POG, are you truly back or did Dal high jack your ship and steal the flag? When you left, I gave up and became a lurker, couldn’t solve the poem anyway. Today is Tampa’s Gasparilla Pirate Fest. You should come check it out. It’s huge and a lot of fun. Third larges parade in America. I would have liked to spend time hanging out with this Eric. F, maybe we could hang out some time. I plan to go to Java Joe’s on Rodeo Road Saturday, January 31, 2015 at 10:00am. I’ll leave my house extra early in case it takes me a long time to get up to Santa Fe given the ice and snow. Yes, F, that is an invitation to hang out for at least 10 minutes. I promise to not laugh at you if you have a hot chocolate with whipped cream and get some on the tip of your nose. I think that I wont ask if that’s snow on your head either. I hope you can make it. I shall be there until noon. C ya… I hope. There is that Cleveland reference that somebody was looking for. Cleveland, NM was their solve. Thanks Forrest for the treat of your great friendship with Eric Sloane. The bronze is so moving – to show the sole of a great person. I couldn’t have said it – but Eric did. Are you listening Dal? Thanks for your great effort for all of us to continue on in this great quest. Very interesting scrapbook.Thanks Forrest and Dal for posting these for us to read.Im curious to kmow what artist sold the best when forrest was running his gallery…I always loved the look of the sacajawea coin,I have quite a few of those myself…I will keep my eyes peeled for anyone suspicious. As a coin collector I would estimate the bill at auction would draw a winning bid around 5k + considering it’s serial number. If anyone dared to steal something of that nature they would be hard pressed to get what it is worth when legally obtained. Welcome back POG, I missed your entertaining posts. Hope you are well. Forrest, thank you for introducing us to the talented people that you have had the pleasure of befriending. I have been playing with an ideal, whats the chance I could get in contact with Glenna Goodacre? I give my word it only for good. Like many here I see opportunity, in my case like one of the people in your past I have no means. Just what I think is a great ideal. Forrest would you rate your friendship with Eric the firmest you have had? Thank you Forrest for sharing this story with us. Its a beautiful bronze, and smile. You have some good friends, bet they feel the same way about you. So much talent in one small place. I am in awe. I am pretty sure you knew that if your math skills are as good as I think or maybe you prefer a sine if you have the time! Now if Mr. Fenn invested that $1000 in Gold 33 years ago, the average price was 376/oz and he could buy just under 2.7 oz which is $3412.34 as of today’s price of gold. The reason it is lower than the investment is because gold tracks more closer to the rate of inflation, with some fluctuations due to world crisis. So if one can find the chest and achieve 6% interest, sell it and invest it! Think of how much value is lost with that chest just sitting there waiting to be found. Perhaps Mr. Fenn you can retrieve the chest, sell it and invest it in a 6% in perpetuity and replace the chest with a certificate to that investment. Think about what that gold would be worth 1000 years from now, how about 10, 000 years?! Better try using one that works Deb properly. $6840.59 is the correct answer. It is easy to double check it with a spreadsheet. Hi Wolf — not only is your answer the correct answer, I don’t think Forrest is as bad at math as he lets on. Good observation – Most every pilot I’ve known took Physics in school. Great story about some great people. There is a smaller replica of Glenna’s sculpture at the Vietnam Veterans Memorial in Angel Fire for those that would like to see it. Has f been photoshopping again? Yes, Wise One 1928 and 1934…. Hmmmm??? Oh for Petes sake! LOL well dang it. Yep, good Deb. that’s probably it. I’m also wondering why the sentence about “The Spirit of St. Louis hanging in front of the Eric’s mural”… Seems a bit odd to me. If Deb’s assumption is correct then that 1,000 dollar note is worth $ 62, 152. 88 cents +/- a couple cents at the current gold per troy ounce price right now. Sound about right? Did you have the number 33 tagged before this SB? @WiseOne….agree and thanks for the smile! Looking at the painting with the jet….looks like the Cloud Symphony oil painting by Eric. Love the bronzes. I don’t really understand how they are made, but I find them very interesting. My grandson loves to get the gold dollars. We call them gold doubloons. This piece by Glenna is the most truly evocative I’ve ever seen. Far & away better than what’s publically available. Forrest, you select the finest individuals as friends, and given the longevity of your friendships the sentiments must be mutual. Thanks for your time spent here with us – largely a group of people you don’t even know. I appreciate you, and the fine example your life reflects. What great talent your friends have. Eric captures the beauty of thIs beautiful world with his heart and your friend Glenna..can capture the soles of people in her sculptures…Brilliant,just Brilliant. Many years ago I had a copy of Reverence for Wood in the woodworking shop. It was inspired required reading. I have always enjoyed Eric’s work, both writing and drawings. I found myself last summer looking through a beautiful book of his paintings and writings at an entirely wood reading room at the library, because this special book could not be checked out. I had quite a serene time exploring his work, and his special insight into American life and the landscape. You were lucky to have known him, Forrest, but then again he got to know you. Thanks for sharing stories about your friends and their endless talents. Scrapbook 31 was a good one about Glenna and the currency. Definitely sparked some interesting blogments. Your friend Eric has been a favorite of mine for years. He is one of a kind…definitely a man of many talents. Your bronze of him is amazing! Raiders of the Lost Ark + Phenomenon + Invasion of the Body Snatchers + The Rat Race! Q: When did sculpture become more important to you? A: I didn’t begin to sculpt until 1969. A good friend by the name of Forest Fenn, who owned a gallery and foundry, gave me a lump of wax and suggested that I try my hand at it. I did a 6″ figure of my daughter, which was an instant success, and a new career was launched. That’s just down right amazing Forrest – brilliant. It must feel great to inspire such great talents and to be apart of their lives. I am sure your father would be extremely proud of you and your teaching/inspirational skills! His father was ALWAYS proud of him Wolf, from the day he was born. I am sure he was Willy but did Forrest ALWAYS feel that way? I think most know what I am talking about so no need to explain it. Jeez. Calculating THAT interest rate would be worse than approximating the collision rate of 2-4 SAmoans traveling down the ice at Mach 5 hot on the wingtips of a goose whose limit is just above 3. Talk about Fast math….and interest…ugh! Seeing Eric Sloane’s warm and embracing smile first thing in the morning is a lovely way to start the day. Thanks for sharing it with us Forrest Fenn and thanks again to Dal and Goofy for the blog. Are you talking about the faint 113 to the right of the J (Kansas City) mark? There may be a couple of additional numbers, but they are harder to read and raised from the others. If it is longitude numbers that would put it in the area of the previous picture clue of wheeler peak NV. By the way did you read through the previous link I sent about the number 11? The photo above of the Memorial is from that website. Series of 1933, NY Giants beat the Washington Senators, fwiw. @DP….nostalgia….Upper Manhattan’s Polo Grounds and also Brooklyn (Dodgers) Ebbets Field. I have lots of memories as my Dad was a huge Brooklyn Dodgers Fan. Still have my 1953 Golden Anniversary World Series (vs NY Yankees) Official Program (Fifty Cents). Fun to look at the advertisements…Camel, Schenley, Beech-nut gum, Emerson, Knickerbocker Beer, Ballantine Ale, Garcia Vega (Havana Cigars), Old Gold, Lucky Strike and many more. Met the “Mick” (Mantle) in the 1970’s when they asked nothing for pictures or autographs. Also have a Polo Grounds Transparency to stick on an automobile or window. When both teams left New York….I became a Yankee Fan around 1957. Thank you…but what does “fwiw” mean? Always a pleasure to read your thoughts. I am glad to see you finally posted of your friendship with Glenna Goodacre. It helps reassure me that I am doing my homework…I mean research. One thing I would like to note is Mrs. Goodacre credits Mr. Fenn with giving her, her first piece of wax to work. Before she met Mr. Fenn she was an Artis/Painter…but Mr. Fenn helped bring out the creative side of making sculptures/bronzes. Mrs. Goodacre is considered to be the best female sculpter in our time. Her work on the Female Vietnam Sculpture is priceless! She made the Henry “Hap Arnold” sculpture at the Air Force Academy. 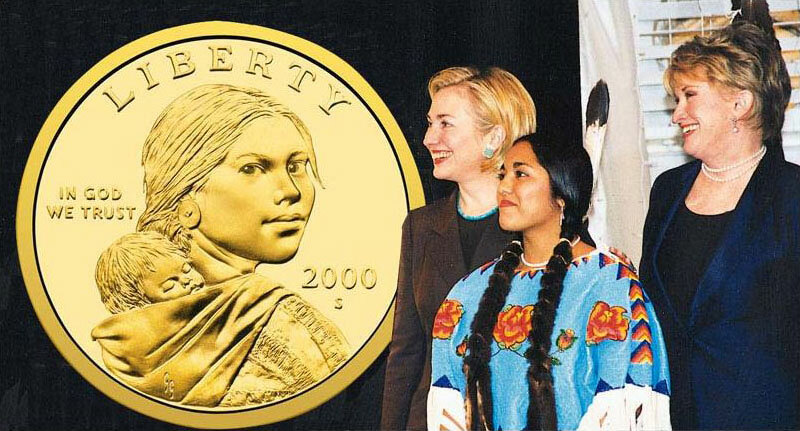 Another thing I feel needs to be mentioned is when she received her $25K from the U.S. mint for her design, she took $25K for her design of the Sacagawea dollar, which weighed 90lbs and was shipped on their dime. Doesn’t that sound like someone else we know? Mrs. Goodacre definitely has found her calling in bronzes! Mr Fenn, the world is definitely a better place with your presence! Thank you! “25K for her design of the Sacagawea dollar, which weighed 90lbs and was shipped on their dime.” ??? Never too old to learn. I always thought someone was talking about a sack of gaweas. Could never figure out what a gawea was. Thought maybe it was like a can of spam, which we all know comes from that little animal Spam. Plural is Spamimals. There’s a clue. Aarrgh! Hmm Pirate, does your mom still buy you Geranimals clothing? And where have you been all these months? We’ve missed you and all the fun you bring to Dal’s blarrg. I wish she could. Thanks swan, glad to be back. Some things just take priority. Glad your back, you shouldn’t disappear like that a few of us were concerned about you. We thought maybe u got lost in the mountains. The title of this SB speaks volumes. Mr. Fenn, I would have enjoyed knowing “your Eric.” Thanks for telling the story of your friendship in Seventeen Dollars a Square Inch. Hello Everyone…I do not post often these days however…if my memory is working correctly tonight…no I do not keep notes so I am depending on Jim Beam…uummm…I mean my memory waaayyyy back at the beginning didn`t Mr f say he had 10…yes…ten of those $1,000.00 dollar bills in serial number sequence that someone ( Glenna maybe ) had given to him and he had at one time planned to put them in the chest but changed his mind…??? Off the top of my head it was one of the $1,000 and a $500 bill he was going to put in the chest… but, he was worried about the moisture so he took them out. I will go double check and make sure I have it correct..
Jim B. is telling me that Mr f said something like he would exchange the Bracelet for the Bills…??? Again…I am just going from memory and my memory is not at it`s best right now…? I wonder why he wished “now” (then). Hi Forrest Fire, DP and I wonder why you wish you had left the $500 and $1000 bills inside indulgence now. Certainly no one will ever feel short changed with what you’ve already included. Would you be able to answer our question? Forrest??? Why are you photo shopping her coins??? Thanks F … I had no Idea how the Interest system worked … Very cool . That was a cool story , what a Artist , Her work is amazing….. The future value (FV) of a dollar is considered first because the formula is a little simpler. The future value of a dollar is simply what the dollar, or any amount of money, will be worth if it earns interest for a specific period of time. If $100 is deposited in a savings account that pays 5% interest annually, with interest paid at the end of the year, then after the 1st year, $5 of interest will be added to the $100 of principal for a total of $105. In the 2nd year, interest will be earned not only on the principal of $100, but also on the $5 of interest earned. Thus, at the end of the 2nd year, there will be 5 more dollars of interest earned from the principal added to the account, plus 25¢ earned from the previous year’s interest of $5. Thus, at the end of the 2nd year there will be $105 + $5 + $.25 = $110.25 total in the account. This is an example of compounding interest, interest that is paid on interest previously earned. This process can be continued for any number of years. Mike , sounds like all you need is the treasure ! On Friday, she thanked Lubbock artist Connie Martin for first teaching her how to draw, and recalled that it was Forrest Fenn who handed her lumps of wax, encouraged her to try to sculpt and eventually poured her first bronzes at his foundry, then on Brownfield Highway. A native of Texas, she started as a portrait painter and trained at Colorado College and at the Art Students League in New York. When she was 19, she tried sculpture, but a professor questioned her ability. It was well-known Santa Fe gallery owner Forrest Fenn who encouraged her. He had a foundry in Lubbock, Texas, that she visited in 1969, and he urged her to try sculpting. She did a tiny figure of her young daughter, Jill, in her dance leotard and took it back to Fenn to cast. She credits him with helping her get her first commissions for busts, which included Dan Blocker (Hoss, from the TV series “Bonanza”). She has now created the likenesses of many famous individuals, including former President Ronald Reagan. Sculpting is pleasing, she said, because of its three-dimensional qualities and lighting contrasts. And clay is a fun medium. Six weeks of study at the Art Students League in New York City in 1967 instilled in Goodacre a deeper commitment to her art. Two years later, Lubbock gallery owner Forrest Fenn encouraged her to start sculpting, and by 1972, Goodacre was exhibiting her work at a gallery Fenn had opened in Santa Fe. Thank you for posting the articles. I had no idea that Glenna had to overcome a brain injury. For me, lesson learned. No limit to what can be accomplished if we fight hard enough. What do you make of the large gray figure that dominates the right hand border of the clouds? Is that a person standing and holding onto ? It looks like it has the head of a mouse. If you turn the photo 90 degrees counterclockwise, then it looks like a galloping stallion going from left to right. Does any of this make sense? You have a very sharpe eye. To me it looks like a man – with a ram or big horned sheep in front of him? The above is really only visable in the first photo – the one with the bronze. LOL – now we get to go with little red- ridin- hood and the tres bears? Symbolic vignettes or pictures inside of pictures like inside jokes. No, it’s a cloud. But if you look very close in the jet window, you can see a one eyed cyclops holding up an olive jar, containing 33 1,000 dollar bills, along with a sack of gaweas. I think I see that too, Pirate. The cyclops is in-flight snacking on those 1000 dollar bills with some fava beans and a nice sack of gaweas. …slurp…slurp…slurp. The sameone eyed bandit herds sheep and dwells in a cave. I noticed that area of the painting… To me it looks like someone fishing into the clouds. The straight line being the fishing pole. That’s my guess anyway. What a rich and wonderful life you have Mr. Fenn! Goes to show life is what you make it! All these wonderful memories will live on forever! Tell us do you still sell your work or the work of others? And if you could what would of you done different? Thanks for sharing. Such a happy look on Eric’s face. Only a great artist could capture such an emotion in clay. Do you know that President Cleveland had a child they called BABY RUTH and there was a big controversy with the Bambino and the candy company about the name. Wasn,t there an SB about Babe Ruth somewhere,Dal…IMO!! He might be trying to hint things here connected to the book. Thanks for sharing this, Forrest. I knew Eric was special, but was not aware of the Glenna Goodacre and how you encouraged her work. Yet another example of you far-reaching impact. Glenda’s work is really touching, I wonder if she ever mentored anyone? How lucky that person must be to have learned from her years of experience. I have/had one of Glenda’s bronzes. In all of my moves I do not know where it is! My sister even asked me about a year ago where it was. We need to move so I can find it in the unpack repack . And BTW F your work is wonderful. These two scrapbooks are cross-linked. Are you suggesting Cleveland and/or endurance? Can anyone tell me if this bust of Eric Sloan is on display somewhere? What awesome characters Eric and Forrest were and are. Hey, Glenna… I like it. Who says you can’t be in two places at once? I’m curious too…Or is this something FF has at his house? Would love to see it!